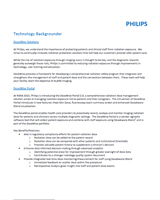 Amsterdam, the Netherlands – Royal Philips (NYSE: PHG AEX: PHIA) today introduced the DoseWise Portal 2.0, a comprehensive radiation dose management software solution aimed at managing radiation exposure risk to patients and clinicians. The software solution allows healthcare providers to record, collect, and analyze imaging radiation exposure, so they can make data-driven decisions to manage dose, and ultimately, ensure patient and staff well-being. With this year’s Joint Commission standards requiring healthcare providers to monitor and utilize patient radiation doses, clinicians are under increased scrutiny to ensure proper exam ordering. Providers also realize the need for accurate dose management for their staff, and are identifying ways to protect them from scattered radiation that occurs during interventional procedures. “Since launching the DoseWise Portal at RSNA in 2014, Philips has been committed to providing industry-leading solutions for radiation dose management,” said Dominic Siewko, radiation health and safety officer, Philips. "In this spirit, our DoseWise Portal 2.0 is the first integrated solution that integrates staff and patient dose, while helping healthcare providers to comply with critical new dose management standards and regulations." Updates to the DoseWise Portal 2.0 feature an enhanced dashboard for viewing patient data that introduces a sophisticated peak skin dose reporting feature to help manage patients undergoing complex fluoroscopy procedures. During fluoroscopy procedures, surgeons use high levels of radiation so they can guide insertions within the body, producing highly localized radiation dose levels on the skin at the entry point, which can be a health risk. DoseWise Portal 2.0 alerts healthcare providers when excessive levels are reached that require follow up. The solution also further integrates with DoseAware Xtend for staff exposure data, enabling providers to ensure their staff is protected from high levels of radiation. 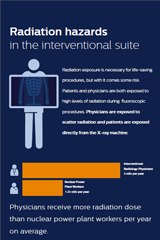 Interventional Radiologists receive the highest amount of radiation dose in the hospital, often nearing annual exposure limits. The DoseAware integration combines staff and patient dose data together in the user interface, helping physicians manage their radiation exposure in real-time. Philips is showcasing DoseWise Portal 2.0 in booth #6736 at RSNA through Dec. 4. Follow @PhilipsLiveFrom or visit www.philips.com/rsna for more information on Philips’ presence at #RSNA15. To learn more about Philips’ DoseWise Portal 2.0 and the full suite of Philips’ dose management solutions, please visit https://www.usa.philips.com/healthcare/product/HC895001.